It’s delightful to receive a box of chocolates. It’s even more enjoyable to receive four boxes. That’s the sweet treat received when a dog is part of your life. Each paw holds a tiny sampler box of assorted chocolates. While cats have been labeled as having toes that look like jelly beans, dogs have toes that, to me, look like decadent chocolate creams. Kitties sport pink, black, or a pink-black combination of toes in bird nests of paw floof. Dogs showcase toes that look like chocolates in furry candy cups. Every canine has unique toes crafted by chocolatiers. They consist of four (or three for tripods) digital pads in the shape of buttercreams, and large metatarsals and metacarpals resembling pecan caramel clusters. They come in dark, milk, or pink chocolate coatings. From chubby pink Pit Bull chocolate creams to chocolate-covered raisin-size Chihuahua toes, their uniqueness makes me smile. These delicacies are enhanced by neatly trimmed or wildly hairy candy cups of tan, blonde, white, brown, or gray. The toes of Rebel, an Alaskan Malamute. 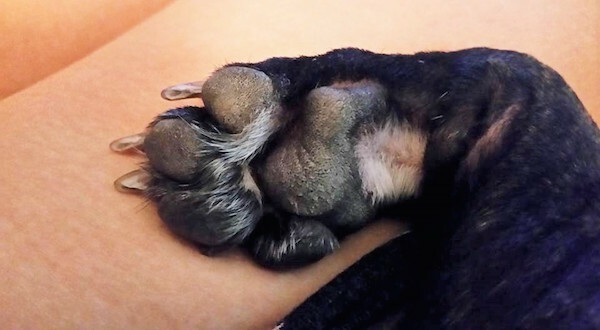 Sure, some dog toes are a bit bushy or rough looking, but think of them as textured chocolates with ornate drizzles, coconut flakes, or chopped nuts. I know what some of you may be thinking, that dog paws smell like corn chips! Yes, dog paws have the reputation of smelling like corn chips at times (because of natural bacteria that lives on their paws), but even corn chips are a snack some people find delicious when dipped in chocolate. Who hasn’t held a dog paw in their palm and gently squeezed the toes between their fingers like they are selecting a buttercream from a box of chocolates? We make commemorative paw prints with paint on artist canvas, we press the pads into soft clay to make ornaments, we take photographs holding our beloved dog’s paw in the palm of our hand. Some people have their dog’s paw print tattooed on their body. Dogs are noted for loving their master unconditionally. Fittingly, giving chocolate to someone is a symbol of love. Chocolate increases the brain’s level of serotonin, the feel-good brain chemical. Serotonin plays a major role in positive mood and emotional health. Likewise, studies show that having a dog can help reduce stress, anxiety, and depression as well as combat loneliness. It seems fitting that all the love a dog brings to us is carried on sampler boxes of chocolates. 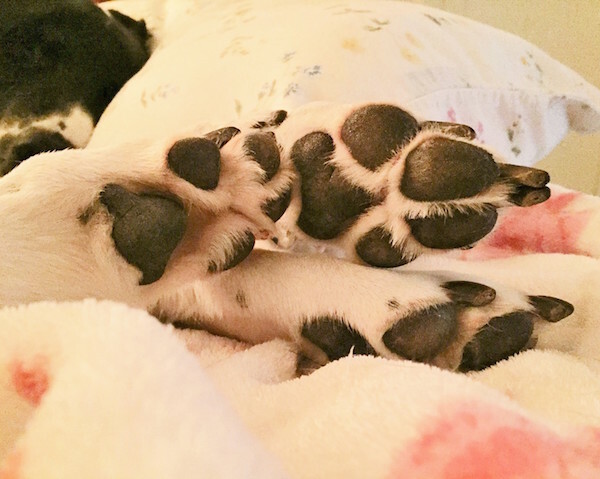 Show us your dog’s chocolate toes! Photo at top: Terrier mix Mackenzie’s toes. About the author: Tracy Ahrens is a veteran journalist, author, artist, and mom to three rescued cats and one dog. She shares her pet stories with several publications including Catster.com and Dogster.com. See her website at tracyahrens.weebly.com and add her children’s book, “Sammy Sparrow’s First Flight,” to your collection. All proceeds help nine humane organizations. 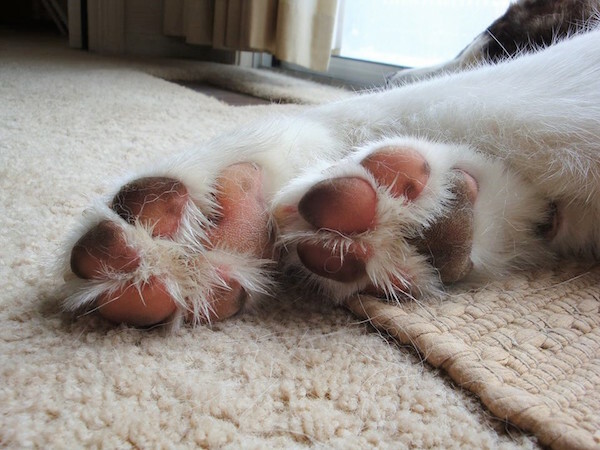 The post If Cat Toes Look Like Jelly Beans, Then Dog Toes Look Like Chocolates appeared first on Dogster.